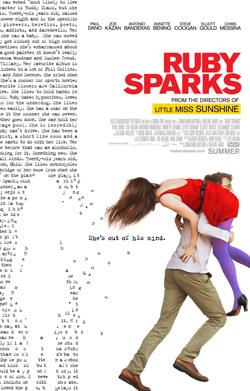 Trailer for Quirky Romantic Comedy Ruby Sparks. Paul Dano, Zoe Kazan, Antonio Banderas and Annette Bening star in Ruby Sparks. Watch the movie trailer below. Calvin (Dano), a young novelist who is struggling with his writing and romantic life, finally makes a breakthrough with a character named Ruby. When Calvin finds Ruby (Kazan), in the flesh, sitting on his couch about a week later, he is completely flabbergasted that his words have turned into a living, breathing person. MPAA Rating: (R) for language including some sexual references, and for some drug use. Calvin (Paul Dano) is a young novelist who achieved phenomenal success early in his career but is now struggling with his writing – as well as his romantic life. Finally, he makes a breakthrough and creates a character named Ruby who inspires him. When Calvin finds Ruby (Zoe Kazan), in the flesh, sitting on his couch about a week later, he is completely flabbergasted that his words have turned into a living, breathing person.